When the editor of your favorite magazine asked me for a new contribution about innovation, offering me to write about bitcoin, artificial intelligence, data protection, GAFAs or China, I was the victim if not of a slight dizziness, at least of a certain weariness. I just had to add to this list Fake news, Trips to Mars or Replacement of Humans by Machines and my ongoing passion for startups and technological innovation turned into a light nightmare. It seems to me that the more we talk about innovation and the less we really innovate. When I explain my slight skepticism to anybody, they usually start with the mention of replacing the cashier of the Migros (a “famous” chain of Swiss supermarkets) with a machine. I reply that it seems to me that we, buyers, have replaced the cashier. If the media relayed in 2011 Foxconn’s announcement that it wanted to install a million robots in 3 years, threatening the 1.2 million employees, an online search indicates today that it has a ability to install 10,000 robots a year, and still the same number of employees. Silicon Valley, having been at the origin of the major innovations of the last fifty years, is scrutinized more attentively. Of course the GAFAs represent a real threat: the two A become the supermarket of the world while the G and F support them by advertisements based on data that we have kindly given them, putting them in a quasi-monopoly situation. But you read well, supermarket, advertising. And that is what is called major innovations? And what about globalized venture capital? Softbank has announced the launch of a 100 billion fund, by far the largest ever. In the last two months, 10 internet startups (including Dropbox and Spotify) have announced their intention to go public. The figures are dizzying: they generated 10 billion in revenues and 2 billion losses in 2017, thanks to 4 billion of funds raised since their creation. Venture capital has become an infernal machine that, like China and the GAFAs, seems unstoppable. But the venture capital that financed in 1976 Genentech and Apple with a few millions today massively funds the “uberisation” of the world, new global supermarket, and less and less the “deeptech”. I see in these trends an accelerated globalization but few major innovations. Do not get me wrong, the innovation flow was exceptional in the 20th century and developments continue. In biotechnology, the Crispr-CAS9 technology  is as promising as the genetic revolution of the 1970s. Three startups, Crispr Therapeutics, Intellia Therapeutics and Editas Medicine went public in 2016 and promise to cure 10,000 diseases. But today these three companies represent less than $70 million in revenue and more than 200 million in losses in 2017. We do not yet have gene therapy or personalized medicine. Google’s Alphago beat the best go player, but nasty voices ​​say that it’s only the largest computing power and the largest data storage of computers that has allowed such performance, and no particular invention or intelligence . In more complex contexts, the machine is not able to compete with humans. And what will really bring us the multiplication of Big Data? But the promises of some to politicians and others to their shareholders, amplified by the media, are sometimes an insult to intelligence: why parasitize the human spirit with promises of (virtual) innovations sometimes more “abracadabrantesque” one than the others and ultimately disappointing when the real world is sufficiently complex and exciting? 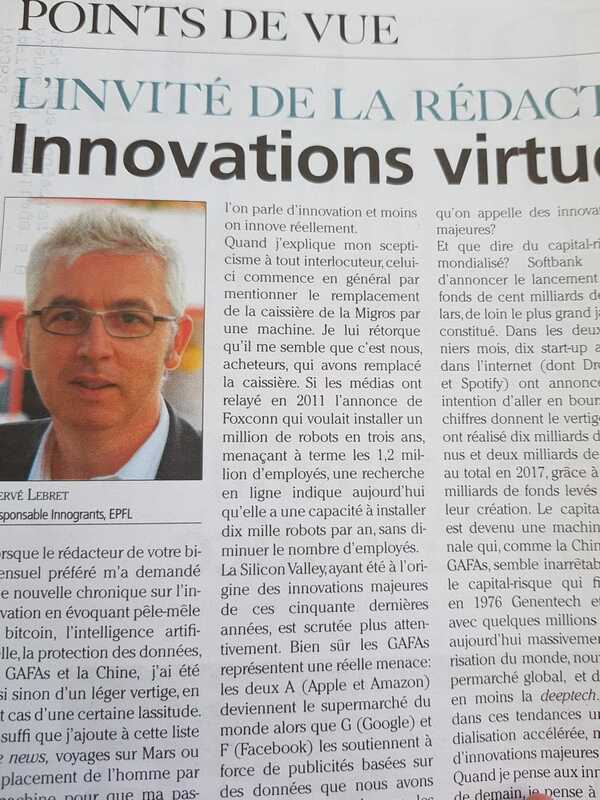 This entry was posted in Innovation and tagged Entreprise Romande, Innovation on May 14, 2018 by Hervé Lebret. 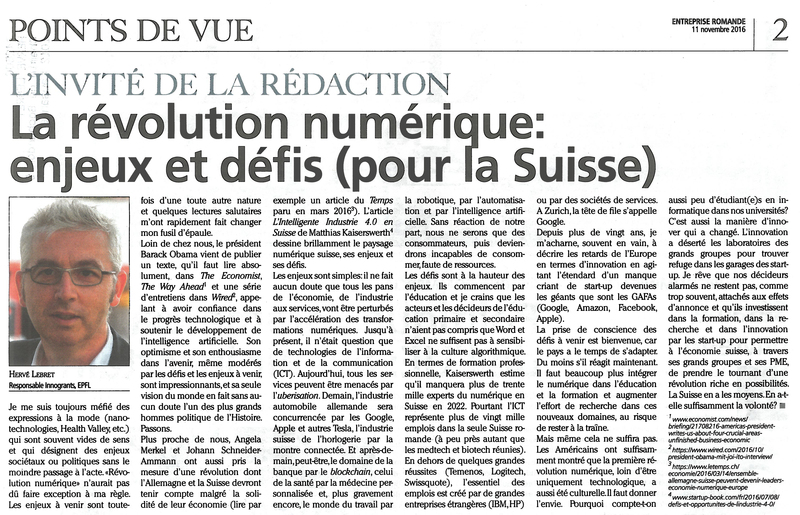 The digital revolution: stakes and challenges (for Switzerland). 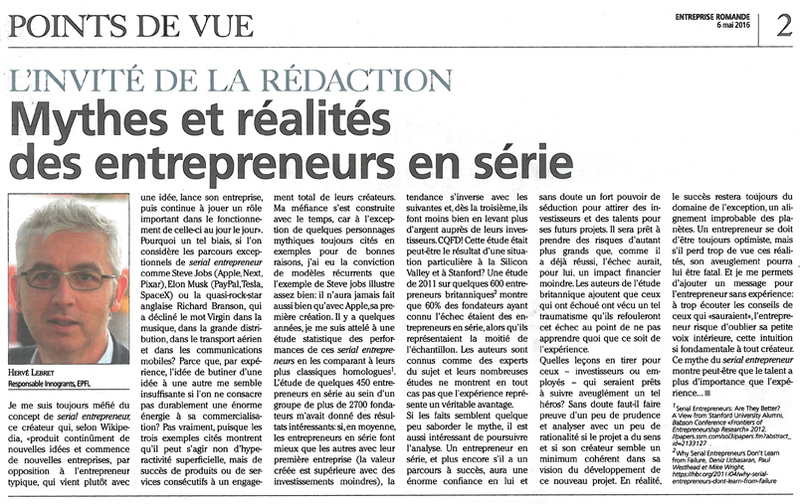 My latest contribution to Enterprise Romande, this time about the digital revolution. Below is my “quick and dirty” translation. I have always been suspicious of fashionable expressions and buzzwords (nanotechnologies, Health Valley, etc.) that are often meaningless and refer to societal or political issues without inducing the slightest change. “Digital Revolution” should not have been an exception to my rule. But the stakes ahead are of a completely different nature and a few salutary readings quickly made me change my mind. Far from home, President Barack Obama has just published in The Economist a text, which must be read absolutely, the Way Ahead  and a series of interviews in Wired  calling for confidence in technological progress and for supporting the development of artificial intelligence. His optimism and enthusiasm for the future, even moderated by the challenges and stakes ahead, are impressive and his only vision of the world makes him undoubtedly one of the greatest leaders in history. Closer to us, Angela Merkel and Johann Schneider-Ammann also took the measure of a revolution which Germany and Switzerland will have to take into account despite the solidity of their economy (see  for example). The article “Smart Industry 4.0 in Switzerland” by Matthias Kaiserswerth  brilliantly describes the Swiss digital landscape, the stakes and the challenges. The stakes are simple: there is no doubt that all sectors of the economy, from industry to services, will be affected, not to say “disrupted” by the acceleration of digital transformations. So far, only information and communication technologies (ICT) have been impacted. But today all services can be threatened by the “uberization”. And tomorrow the German automotive industry will be challenged by the Googles, Apples and other Teslas of the world, the Swiss watch industry by the connected watch. And the day after tomorrow, perhaps, bank services by blockchain, health services by personalized medicine and even more seriously the world of labor by robotics, automation and artificial intelligence. Without any reaction from us, Europeans, we will become consumers only, then unable to consume due to lack of resources. The challenges are up to what is at stake. They start with education and I fear that the actors and decision-makers in primary and secondary education have not understood that Word and Excel are not enough to raise awareness about the algorithmic culture. In terms of vocational training, Kaiserswerth estimates that there will be a shortage of over 30,000 digital experts in Switzerland in 2022. Yet ICT represents more than 20,000 jobs in French-speaking Switzerland alone (in fact about as much as Medtech and Biotech together). But except some great success stories (Temenos, Logitech, Swissquote), most jobs are created by large foreign companies (IBM, HP) or service companies. In Zurich, the leader is called Google. For more than 20 years I have been trying, often unsuccessfully, to describe Europe’s innovation gaps by shaking the banner of a shortage of start-ups that have become such giants as the GAFAs. An awareness of the challenges ahead is welcome as the country has time to adapt. At least if we react now. Much more needs to be done to integrate digital technologies in education and training and to increase the research effort in these new fields, at the risk of lagging behind. But even this will not be enough. The Americans have sufficiently shown that the first digital revolution, far from being solely technological, was also cultural. We must stimulate the desire. Why are there so few computer science students in our universities? Innovation itself has drastically changed. Innovation has deserted the laboratories of large groups to find refuge in the start-up garages. I dream that our alarmed decision makers do not remain as too often attached to short-term messages and invest in education, research and innovation by start-ups to enable the Swiss economy with its large corporations and many SMEs to adapt to a revolution rich in opportunities. Switzerland has the means. Does it have the will? This entry was posted in Innovation and tagged Entreprise Romande on November 17, 2016 by Hervé Lebret. This is my latest contribution to Entreprise Romande. This is a topic I have covered from time to time and though that it would be interesting to share it with a wider audience thanks to the FER newsletter. I have always been suspicious of the concept of serial entrepreneur, this creator who, according to Wikipedia, “continuously comes up with new ideas and starts new businesses, as opposed to a typical entrepreneur, who will often come up with an idea, start the company, and then see it through and play an important role in the day to day functioning of the new company.” Why such a bias if one considers exceptional serial entrepreneur like Steve Jobs (Apple, Next, Pixar), Elon Musk (PayPal, Tesla, SpaceX) or English “rock star” Richard Branson who declined Virgin in music, retail, air transportation and mobile communications? Because from experience, the idea of going from one idea to another seems far from sufficient if the entrepreneur does not invest an enormous and sustained activity to market and commercialize her project? Not really, since the three examples show that it can be not superficial hyper-activity, but the success of products or services consecutive to a total commitment of their creators. My suspicion was built over time, because with the exception of some mythical characters always cited as examples for good reasons, I had the belief of recurring “patterns” and the example of Steve Jobs is a good illustration: he has never done as well as with Apple, his first creation. A few years ago, I dedicated some time to a statistical study about the “performance” of these serial entrepreneurs in comparison with their more conventional counterparts. The study of some 450 serial entrepreneurs out of a group of more than 2700 founders gave some interesting results: if on average, serial entrepreneurs do better than others with their first business (the value created is larger, and with less investment), the trend is reversed with the following ventures, and beginning with the third, they do less well, while raising more money from their investors. QED! This study was perhaps the result of a particular situation in Silicon Valley and Stanford? A 2011 study of some 600 British entrepreneurs  shows that 60% of the founders having experienced failure were serial entrepreneurs while they accounted for half of the sample. The authors are known as experts on the subject and their many studies do not show that experience is a real advantage. This entry was posted in Start-up data and tagged Entreprise Romande, Serial Entrepreneur on May 9, 2016 by Hervé Lebret. – Why the Unicorn Financing Market Just Became Dangerous…For All Involved, published in April 2016. 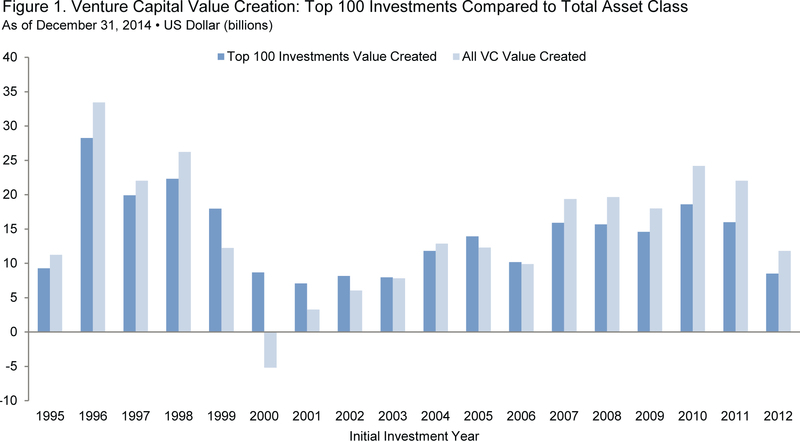 The Kauffman foundation explained in 2012 that the returns of venture capital have not been as good in the last 10 years as they were in the 80s and 90s. The reports also shows something which is quite well-known I think: the VC “industry” is much bigger than in the 90s, but with fewer funds. 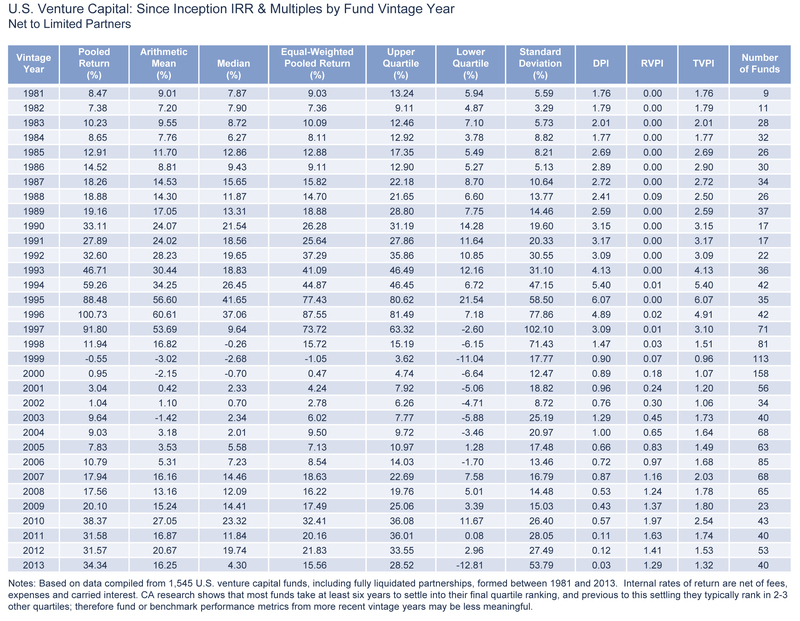 The explanation is simple: individual funds have grown from $100M to $1B+… The conclusion of the Kauffman foundation is that funds of funds, pension funds, limited partners (LPs) should be careful about where and how they invest in venture capital. Here are some graphs provided in the study. – Move a portion of capital invested in VC into the public markets. 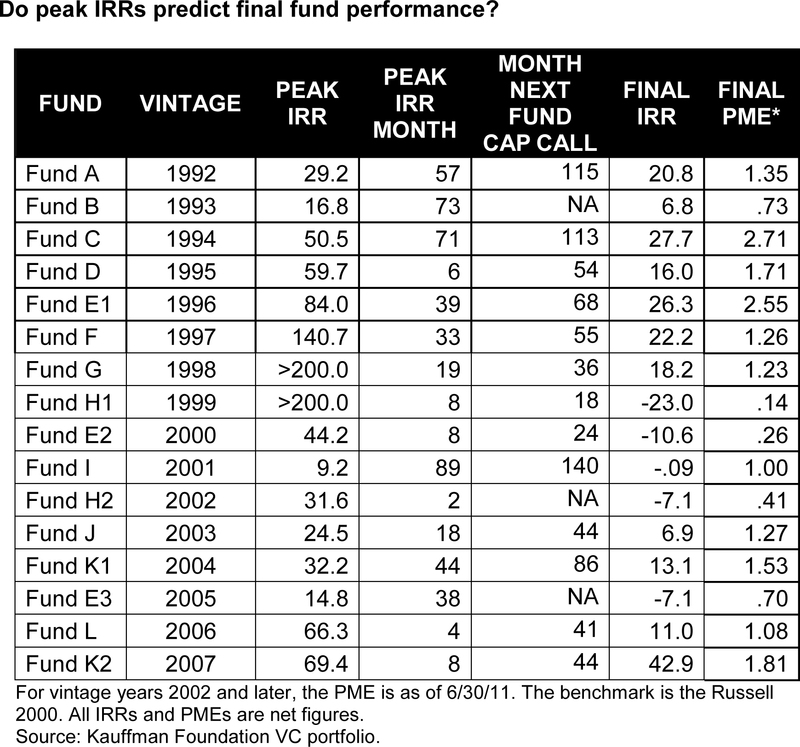 There are not enough strong VC investors with above-market returns to absorb even our limited investment capital. 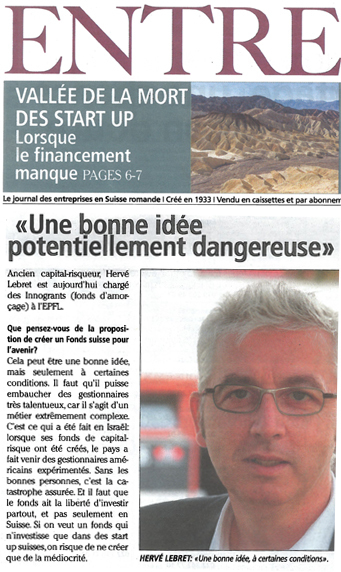 Former venture capitalist, Hervé Lebret is now responsible for Innogrants (seed money) at EPFL. What do you think of the proposal to create a future Swiss Fund? This may be a good idea, but only under certain conditions. It must be able to hire talented managers because it is an extremely complex business. This is what Israel did when it established its venture capital funds, it brought in experienced American managers. Without the right people, it’s a recipe for disaster. And the fund must have the freedom to invest anywhere, not only in Switzerland. If you want a fund that only invests in Swiss start-ups, we may only create mediocrity. Because no European fund can prosper by investing only in its own country. It’s a matter of scale. Only Silicon Valley has sufficient critical mass. The Californian model of venture capital is to lose money in most investments and make a few homeruns such as Google or Airbnb. So you need to have ten thousand ideas to create a thousand companies, then one hundred will grow, ten will be successful and one become Google or Airbnb. You must be able to create such a success every five years, and Switzerland just does not have the critical mass. And it is dangerous to focus too much on money. Yes. Money is a necessary, but not sufficient for success. It requires funds, but also talent, a market, a product and ambition. It is not because we make money available to start-ups that success will come – the other ingredients should also be present. It is true that Switzerland lacks venture capital, but this is not what explains that Google, Apple and Amazon were not born here. This is in my opinion rather a cultural question. We lack ambition and rebellion. And this is the only factor that cannot be decreed by the authorities. Entrepreneurs are satisfied to aim at the creation of a viable firm of modest size, in which they retain control. In Switzerland, the start-ups create fewer jobs than McDonalds. Neil Rimer (note: co-founder of venture capital firm Index Ventures) wrote two years ago: “We and other European investors constantly are looking for world-class projects from Switzerland. I think there are too many projects lacking in ambition and supported artificially by organs – which also lack ambition – that give the feeling that there is sufficient entrepreneurial activity in Switzerland.” I have to agree with him. This entry was posted in Venture Capital and tagged Entreprise Romande, Venture Capital on April 26, 2016 by Hervé Lebret. Why doesn’t Europe create any Google or Apple? 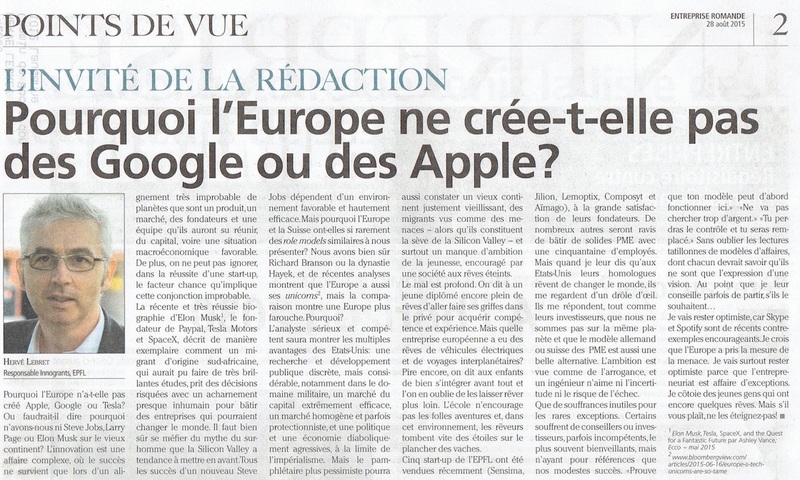 Why did not Europe create Apple, Google or Tesla? Or should we say, why don’t we have Steve Jobs, Larry Page and Elon Musk on the old continent? Innovation is complex and success comes only as an unlikely alignment of planets that are a product, a market, founders and a team they have managed to assemble, capital, and even a favorable macroeconomic situation. Also we cannot ignore in the success of a start-up, the luck factor involved in this unlikely combination. The recent and great biography of Elon Musk , the founder of PayPal, Tesla Motors and SpaceX describes in an exemplary manner how a migrant from South African origin, who could have been a very brilliant student, took risky decisions with a nearly inhuman focus to build businesses that might change the world. We must of course be wary of the myth of the superman that Silicon Valley tends to highlight. All the success of the new Steve Jobs will depend upon a favorable and highly efficient environment. But why Europe and Switzerland create so rarely similar “role models”? We have of course Richard Branson or the Hayek dynasty and recent analyzes show that Europe has its “unicorns”  but the comparison shows a “shy” Europe. So why? The serious and competent analyst will explain the multiple benefits of the United States: a discreet but substantial public R&D, particularly in the military field, a highly efficient capital market, a homogeneous and sometimes protectionist market, and a devilishly aggressive policy and economy at the limit of imperialism. But the pessimist pamphleteer may also see an aging (precisely) old continent where migrants are seen as a threat – whereas they are the lifeblood of Silicon Valley – and more seriously a lack of ambition of youth, encouraged by a society with dreams dying off. The roots of our weakness are deep. We say to a young graduate still full of dreams to go and learn from the private sector to acquire skills and experience. But is there any European company with dreams of electric vehicles and interplanetary travel? Worse, we say to the children first and foremost to integrate well and we forget to let them dream further. The school does not encourage the crazy adventures and in this environment dreamers quickly fall from the stars on dry land. Five EPFL start-ups have recently been sold (Sensima, Jilion, Lemoptix, Composyt and Aïmago) to the satisfaction of their founders and many others will be delighted to build strong SMEs with fifty employees or so. But when I tell them that in the United States their counterparts dream of changing the world, they look at me with a funny look. They tell me as their investors that we are not on the same planet and that the German and Swiss model of SMEs is a beautiful alternative. The ambition is seen as arrogance and an engineer does not like uncertainty or risk of failure. I will remain optimistic because Skype and Spotify are recent encouraging counter-examples and Europe took the measure of the threat, I think. I will mostly remain optimistic because entrepreneurship is a matter of exceptions and I meet young people who still have some dreams. But please, do not turn them off! Elon Musk: Tesla, SpaceX, and the Quest for a Future Fantastic Ashley Vance; Ecco – May 2015. This entry was posted in Silicon Valley and Europe and tagged Entreprise Romande on August 31, 2015 by Hervé Lebret. Here’s my most recent contribution to Entreprise Romande. Thanks to Pierre Cormon for giving me the opportunity of this opinion column. “You have money goal you-have little capital.” This is essentially the phrase that the US ambassador in Switzerland, Ms. Suzie Levine, delivered at a ceremony in honor of the ventureleaders alumni – a group of young Swiss entrepreneurs – last November 15 in Bern. She said she remembered it after hearing it from one of her recent contacts. I also quote her from memory and since then, I thought about it many times, trying to understand it. The first explanation, the most obvious probably is due to the factual finding of the weakness of the Swiss venture capital. The figures vary from 200 million to 400 million per year, depending on whether one defines venture capital as the money invested in Swiss companies (regardless of the origin of the capital) or capital invested by Swiss financial institutions (regardless of the geography of the companies). For comparison, venture capital in Europe is of the order of 5 billion and in the US of 30 billion, or 75 times less in Switzerland than in the US, while the population is 40 times smaller. A second explanation, perhaps less known, is related to the relative lack of “business angels” (BAs). While Switzerland has the highest density of “super-rich” and one of the highest living standards in the world , investments by individuals in Swiss start-ups are limited. Swiss startups unfortunately do not benefit from this potential windfall: the amounts invested by BAs are around 50 million per year and 30 billion in the US. And the situation is even worse: most of the US investment is made in two regions (Silicon Valley and Boston), which does not allow anymore to poner the figures in relation to the population size. Some players such as SECA, the Swiss association of private investors, or the Réseau through its “manifesto for Swiss start-up”  are conscious of the deficit. They lobby to create new venture capital funds of funds and favor private investment in start-ups with lower taxation. Finally, but this in itself would be the subject of another article, the transition from business angels who provide the first funds (up to a million in general) and venture capitalists who are involved from 5 to 10 million is much less natural than in the US because of a lack of trust and mutual understanding. However, I fear that the citation / title of this article can not be explained solely by the finding of simple numbers. The third explanation, I should say interpretation of the word capital is that of human or cultural capital. The strength of the US investment in innovation was not financial only. It requires individual attitudes more than economic reasonings. 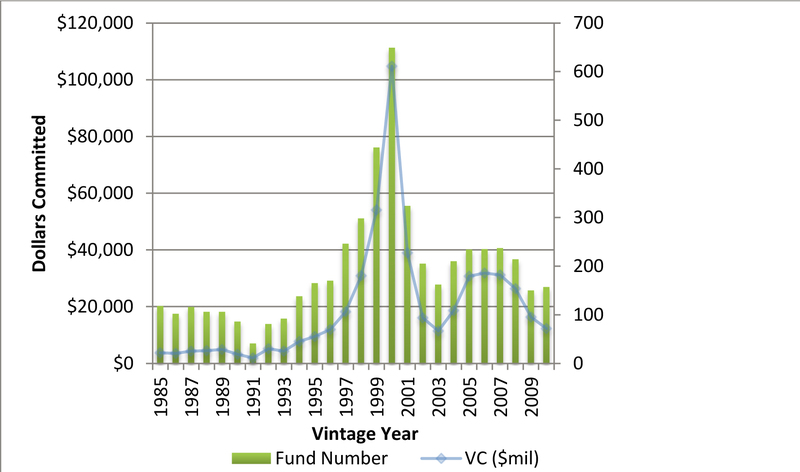 One note: it may be useful to recall that institutional venture capital – funds from pension funds and corporations – was born out of the vision of a few individuals who believed in the potential of innovation in entrepreneurship; it is the business angels who created the venture capital (not the reverse). This vision comes from a typical American optimism and also more prosaically from the fact that these first business angels had made money by betting on innovation. The Swiss money is less adventurous and above all – this is often said to me – from a capital creation of more traditional and maybe less innovative economic value. It is also transmitted by inheritance. As it is more hard-won, the fear is stronger of losing it and the confidence lower to make it grow again. Risk taking and lack of stigma associated with failure are typical features of American entrepreneurship, this is well known. We can better understand the (good) reasons for this larger Swiss (and European) conservatism. Worse: because the financial capital travels easily and many Swiss start-up entrepreneurs look for their investors in London, Boston and San Francisco, this cultural capital is lacking in Switzerland. I do not speak of the quality of the executives in the large companies and SMEs, who perfectly manage their businesses and rarely leave them (rightfully maybe!) to create their businesses. I speak of the non-existence of men and women who have succeeded in the world of startups. One could become tired of always refering to Daniel Borel as the “role model” of Swiss high-tech entrepreneur. Silicon Valley has created in the same period thousands of millionaires in technology, wealthy individuals who systematically reinvest their money, and their time most importantly, in new adventures. I had found the quote a little unfair, when I first heard it, because I had misunderstood it and at worst easy to fix if it referred to a lack of financial capital. I realize it refers to an even more serious situation as it takes time if we want to change a culture. PS: the following table was not in the article but I had included in my book to explain the “cultural” differences between American and European venture capital. This entry was posted in Venture Capital and tagged Business Angels, Entreprise Romande, Switzerland, Venture Capital on February 8, 2015 by Hervé Lebret. Innovation and Society: are the Returns and Benefits Sufficient? The Enterprise is more than ever at the core of the political debates through its role in the creation of jobs and wealth – both individual and collective. It is indirectly the source of populism and of protectionist temptations. Inside and outside of its walls, innovation is the subject of similar tensions: are the returns and benefits of innovation sufficient for society? A recent book tackles the topic of the respective roles of business and government in innovation: Mariana Mazzucato, a professor at the University of Sussex, develops in The Entrepreneurial State  – a fascinating and quasi-militant book – the argument that the States have not collected the fruits not only of direct investments in their universities, and even indirectly from the help and support provided to businesses, investments and supports that are at the origin of the major innovations of the last fifty years. Mazzucato brilliantly illustrates this through the example of the iPhone and the iPad, which integrate components initially financed by the public bodies: from electronics developed for the space and military programs to the touch screen or GPS, or even Siri, the voice recognition tool (which has sources at EPFL), the author shows that Apple has masterfully integrated technologies initiated by public money. Google is also the result of research done at StanfordUniversity. Mazzucato adds that clinical trials for new drugs are mainly made ​​in hospitals funded by public money, from molecules equally discovered in university laboratories. Mazzucato therefore advocates major reforms both on the governance of the initial support and on taxation. She fights for a new tax system that would compensate the absence or insufficiency of direct returns to universities or from businesses, all the more that it is indeed undeniable that multinational companies easily optimize their taxation. She shows how Apple has taken advantage of international rules to create subsidiaries in Nevada or Ireland to minimize its taxes. The English researcher is convincingly claiming that Apple has to pay more. But how to pay? Paying a license for the GPS, but to whom? I’m not even sure that the GPS is patented. And if the Internet had been patented, it would probably not have had the same development – I do not ned to go over the limitations of the French Minitel. By seeking more direct financial returns (which are not as insignificant as one might think – Stanford has received more than $300M for its equity shares in Google and over $200M of the first patents in biotechnology), the risk would be very high to discourage creators and stifle innovation. I doubt that the solution lies in more rigorous national rules. If from experience I lean more toward Thiel’s view on innovation as an individual act of exception, actually quite far from the public investment, even if it is its seed, yet, I cannot agree with abandoning the public good. It is the soil that allows the emergence of exceptional talent. Companies also have their share of responsibility in discounting the importance of the collectivity. Just like in any complex human activity, innovation is a delicate balance between private and public actors. But especially today, issues have become global. The question is not so much as Mazzucato says that the role of the state has been largely underestimated in this process, but rather that the tax return has largely been decreased by globalization and the lack of economic governance. Tax as a single global solution? Does society receive any return from the public money spent on schools, roads, security? No, because it’s not an investment in the true sense of an objective of financial gain. These are infrastructure provisions that allow citizens and businesses to exist and develop properly. And they 8should) pay taxes in return. When Darpa funds Stanford, it is not sure that a student from Korea will not benefit from it and later work for Samsung. The concept of ​​supporting national champions seems of another age. We are left with Tax, in a renewed vision of its global governance. Whether innovation is in the public or private domain, the world globalization will soon prevent from hiding behind the argument of whom is basically at its origin. Not only individuals but states also must agree upom a greater share of its profits, at the risk of serious crises. At a time when Switzerland reviews its tax policy and its citizens think they can create barriers from its neighbors as its borders, it is important to be aware that the current tensions are an opportunity to revisit the status of innovation in society before new major crises emerge. Wishful thinking? 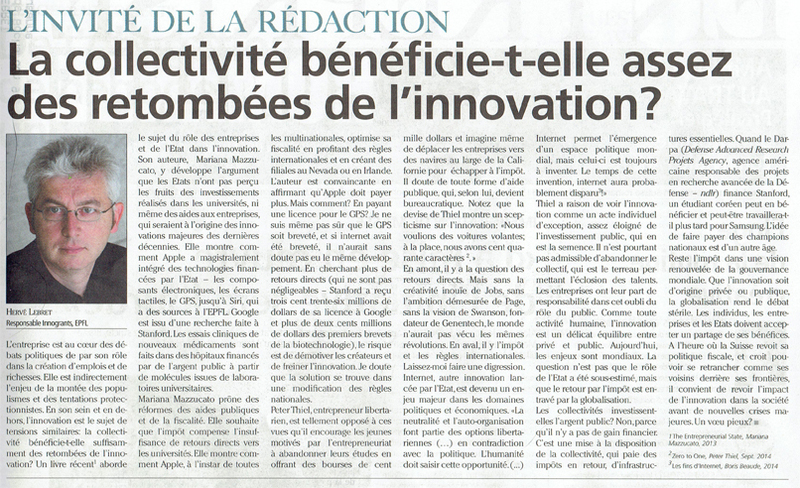 This entry was posted in Innovation and tagged Entreprise Romande, Innovation, Mazzucato, Policy, Thiel on June 30, 2014 by Hervé Lebret. So much has has been said and written about the impact of the vote on Feb. 9 on academic research and education, that I have hesitated before writing this column. Freezing of the exchange of students through the Erasmus + program and the access to ERC grants for top researchers; degradation to the rank of third country in the Horizon 2020 research programs. All this was well explained and should be known to those who are or feel concerned. Foretold disaster or major constraint to which Switzerland will adapt through its own genius, the future only will tell. Finally, the people are sovereign and the concerns expressed trhough the vote are fairly shared, in Europe and even in the USA. Europe suffers probably more than Switzerland and our neighbors have shown their misunderstanding rather than frustration. So I will just try to illustrate here the reasons for my sadness. A simple anecdote to start: I arrived at EPFL in 2004. The first file on which I worked was the project of a young Spanish student, Pedro Bados. He had just finished his master’s thesis as part of an exchange program and his work had produced some nice results. These results were patented, and the student turned into an entrepreneur when he founded NEXThink which today has about one hundred employees. The start-up, which is headquartered on the EPFL campus, is supported in part by foreign capital due to the weakness of the Swiss venture capital scene. Mr. Blocher had told Radio Suisse Romande he did not believe in big European projects that do not work. It is true that innovation can not be planned and very clever is the one who can predict the future. But Pedro’s innovation is real however and simply would not have existed without Erasmus. NEXThink is not the only Swiss company founded by a migrant. Biocartis has raised over CHF 250 million and its founder Rudi Pauwels, is Belgian. He is a “serial entrepreneur” who had come to seek inspiration at EPFL after a first success. More than three quarters of the spin-off EPFL have foreign founders, and half are European. The problem is not so much economic as Switzerland contributed largely to the funding of these programs. It is human. In a recent debate in Neuchatel, Peter Brabeck, chairman of Nestlé, said: “75% of people working in Switzerland in our research and development teams are foreigners; this vote is creating a lot of uncertainty for them. But I can assure you of one thing: Nestlé will not lose a single one of its scientists. But Switzerland perhaps. Because if I do not have the right to employ them in Switzerland, so I will have them work elsewhere on their projects” . Novartis had already made long ago the choice to open a research center in Boston. On a smaller scale, HouseTrip, a recent success story from the Lausanne Hospitality School, moved to London, because of the lack of local talents. Last anecdote: I arrived in Switzerland in 1998 and the process of obtaining my work permit took more than six months…; it was not an easy arrival. The entry into force of the bilateral agreements, in 2002, certainly simplified the decision of Pedro Bados to create his start-up in Switzerland; no doubt. I have no idea how future young foreign entrepreneurs will experience our new situation. Switzerland will probably adapt here too! But I do not see who wins anything at complicating the arrival of talents whereas they leave very easily. I finish on a more symbolic dimension by quoting a participant in another debate on the subject : “And to return to the question of research, EPFL has not only research capacity, it has a serious mission in training. I’m an engineer and I am amazed to see that the very notion of engineer is disappearing when the EPFL is now staking everything on biotechnology. I’d like to see EPFL still train people how to build bridges.” If the academic world has been so little audible despite its attempts, it is perhaps because it is not as well liked as you might think. Switzerland does not like elitism. One prefers established SMEs to start-ups, which do not make people dream as in Silicon Valley and pension funds do not support the venture capital. When I attended a selection committee of promising young people, I heard the jury member smile while indicating that only 2-3% of Swiss students benefited from Erasmus and if it was for them to live what describes the movie “L’Auberge Espagnole” (The Spanish Inn), this may not be so bad. Yet high-tech entrepreneurship also concerns only 2-3% of our students. Scarcity and elitism, I think, are more important than you think. EPFL did not stop training specialists of concrete or mechanical structures. Academic research has even improved the quality and cost of bridges. But the world is changing too. Bioengineering, computer science are promising and future innovations in these disciplines will be much larger than those that improve our bridges and tunnels. One does not need to be a genius to understand this. Except if we have lost faith in science and technology? I can tell you that Asia and America have not lost that confidence. Would Switzerland be like Europe? I understand that the initiators of the referendum are sticking to their positions and consider that the country’s problems were more important than the consequences thereof. Expressing a frustration in front of a Europe in crisis or a concern for the future is one thing. Minimizing the impact this will have on Switzerland seems to be a risky bet. I respect the decision, but I regret it… badly. This entry was posted in Must watch or read and tagged Entreprise Romande, Immigrant, Switzerland on April 17, 2014 by Hervé Lebret. 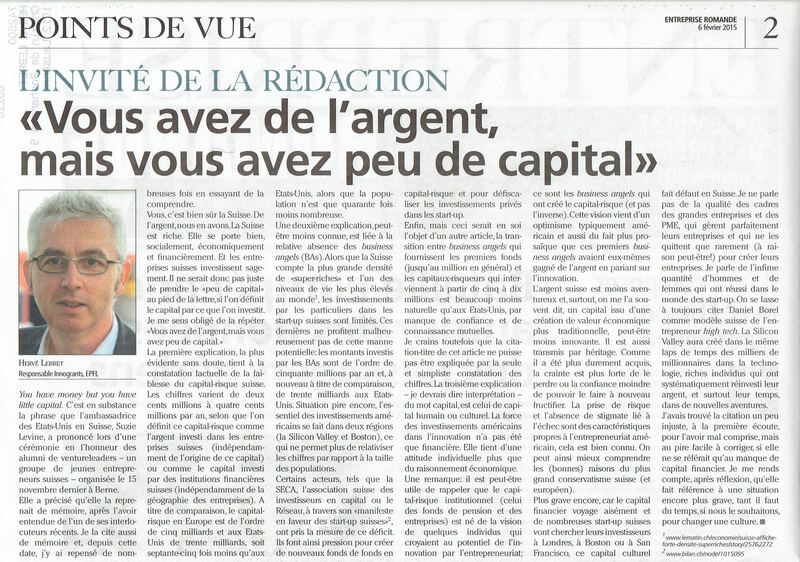 Here was my last column in 2013 for Entreprise Romande, with a subject that is dear to me, the importance of migrants. The paths of innovation and entrepreneurship are paved with a myriad of dilemmas. Clayton Christensen a few years ago had explored the first topic in his Innovator’s Dilemma and last year Noam Wasserman has published the interesting Founder’s Dillemmas. The uncertainty of the market, youth vs. experience, disruptive vs. incremental innovation, the new vs. the established are just a few examples of these difficult choices. A more controversial and politically sensitive subject is the contribution of migrants and foreigners in the field of creation. Just when he debate is growing in Europe as well as in Switzerland about the threat that would represent those who are different and come from elsewhere, it is perhaps worth remembering more positive elements about the importance of openness to outsiders. The Swiss history  reminds us that the watch industry is linked to the arrival of the Huguenots in the sixteenth century; a part of the textile industry in St. Gallen has its origin in England. There is also a French origin in the Basel chemical industry. Perhaps it interesting to recall that Christoph Blocher has distant German roots. But what about Nicolas Hayek, the savior of the watch industry, rocked by his Lebanese and French cultures. Much further, Silicon Valley, the world champion of innovation and entrepreneurship, owes much to its migrants. Of course America is a land of pioneers, but the San Francisco area pushed the logic to an extreme. More than half of the entrepreneurs in this region are of foreign origin and for example Google, Yahoo, Intel had founders with foreign roots. While Europe has a temptation of closing its doors due to its economic difficulties, in the United States, the Start-up Act 2.0 intends to streamline visas for foreigners and to regularize children of migrants to enable them to enter higher education. Japan was another major country for innovation a few decades ago nut it may have suffered from its low level of migration; the country is aging and has not really reinvented itself. Switzerland is a land of migration, let us not forget it. This is one of its strengths. Today, the campus of EPFL and ETHZ have a great deal of students but also of researchers and teachers with foreign origin. The proportion increases much more if you focus on those who create businesses. For those who have received an entrepreneurial scholarship to EPFL, the proportion rises to 75% including 25 % of non-Europeans. Would foreigners be more talented and creative? The answer is rather a larger experience of what is unknown and uncertain. Migrants have agreed to leave their homeland, sometimes leaving everything behind. And they know by experience that we can recover from this loss. They know well that it is always possible to start again and the fear of failure is reduced. He also learned to domesticate novelty. It should be added that a migrant has less access to established circles and is stuck by “glass ceilings”. They must often build they destiny. From this point of view, they do not take the jobs of anyone, they create new opportunities, that will become beneficial to others! This entry was posted in Silicon Valley and Europe and tagged Entreprise Romande, Europe, Immigrant, Switzerland on January 6, 2014 by Hervé Lebret. Does the Swiss culture tolerate failure? Here is my fourth contribution to Entreprise Romande. I realize now it is often about failure and innovation. This new article maintains the tradition. And because it was a special issue about failure, let me provide a translation of the editorial. We are not all equal vis-à-vis failure. The fact is confirmed by a detailed study published by Barclays in late 2012. First, Europeans have more difficulty seeing failure as positive (69%) than Americans (71%), Asians (80%) and Middle Easterners (91%). Second, entrepreneurs have a less negative attitude towards failure than the rest of the population. They often think that failures have shaped their character, that this event has taught them a lot and they were able to bounce back quickly. Entrepreneurs are also far more optimistic than the rest of their fellow citizens. This phenomenon is described in the medical literature: it seems that a high number of successful entrepreneurs are characterized by a genetic form of psychiatric bias, which predisposes them to be creative, enthusiastic and somewhat less apprehensive vis-à-vis risk taking. John Gartner, the psychiatrist at the origin of this study, highlights the specific features of these characters: “Having that kind of confidence can lead to blindness when facing risk, because these individuals do not believe they can fail. (…) However, if they fail, they will not stay down for long and will soon be energized by a completely new idea”. More generally, the Barclays study shows that tolerance for failure is essential to growth. The process of “creative destruction”, that is obsolete ideas, technology and business models give way to new impulses, is essential to economic progress and job creation. For this process to be effective, we need entrepreneurs who want to take risks, and an environment that supports their efforts. Until now, Switzerland seems to have done OK, as evidenced by its economic health and its high ranking in terms of innovation and competitiveness. As the Swiss are not the champions of tolerance for failure, they must be supported by appropriate framework conditions and encouraged so that those who have the entrepreneurial spirit may try … without taking too much risk! These topics are covered in great detail in the Magazine Entreprise romande. The taboo of failure and bankruptcy is analyzed in all its forms and put into perspective with practical advice and testimonials from entrepreneurs. Happy reading … enjoy the summer! “The Swiss Society gives us so many slaps in the face through education that we are afraid of being creative, because we show then our weaknesses. By expressing our dreams, we do an intellectual striptease; it is feared that others see them as bad, not good, not nice and not fair.” So speaks Elmar Mock, inventor of the Swatch and founder Creaholic. The Swiss school system is indeed not known for its creativity. The famous (in French speaking Switzerland) « faut se gaffer » (“don’t be goofy”) might make you smile. Our teachers too seem to give more importance to the rigor than to the creativity of our little darlings. The room for error is unconsciously repressed. If one accepts the idea that innovation is above all creating in situations of uncertainty, the statement is worrying. Yet Switzerland is world champion of innovation in almost all global reports. Is there a contradiction? Innovation is a subtle thing. Innovation is not limited to invention and innovation is not about technology only; it is the result of a process, following which are created products, services or new processes that will have to demonstrate that they answer a (commercial or non-commercial) need. The process leading to innovation is long, unpredictable and hard to control, innovation cannot therefore be planned and we have to accept failure. Clayton Christensen, a professor at the Harvard Business School, built a theory explaining the process of disruptive innovation, the one innovation which allows the emergence of new revolutionary products such as the Internet, the mobile phone, but also the low-cost airlines, the one innovation which also allows new players to emerge and replace their older competitors. According to Christensen, disruptive innovation cannot occur within established institutions. The best companies are listening to their customers and those only want to improve existing products and will rarely desire new products. The U.S. has seen more than 80 major new companies emerge since 1970, and France, only 4. And Switzerland? Switzerland is world champion of innovation firstly because the framework conditions are excellent. Everything is done for businesses to succeed, minimizing barriers and constraints. Then, because there is a culture of work well done. Apprenticeship, in the early years of training, helps in maintaining this tradition and Swiss companies are known to be listening to their customers in order to improve existing products in the right direction. But what kind of innovation are we talking about? Probably not about the one which enables technology breakthroughs. No, rather of a different type of innovation, incremental innovation, made of “gradual, continuous improvement of techniques or existing products; usually incremental innovation does not fundamentally change the dynamics of an industry, or does not require a change in behavior,” according to wikipedia. Switzerland is champion of incremental innovation through a dense network of highly performing SMEs. Failure is relatively absent, when the attention to every detail is permanent. But is it enough? Not only the Swiss school system is not known for its creativity, but furthermore our academic spin-offs create few jobs. If we accept the corollary that innovation is a source of growth and new jobs, we might not be as innovative as it might be desired. We are obviously efficient for incremental innovation, but certainly not as good when it comes to disruptions. Except for one example that comes easily to my mind, the Swatch. But Nicholas Hayek was not the product of the Swiss culture! I could add Nespresso, but Eric Favre, inventor of the product, had suffered a strong initial reluctance from Nestlé to the point of saying: “The Swiss economy lacks real entrepreneurs!” The difficulty of integrating risk and radical innovation can make anyone short-sighted when experiencing ongoing changes and cause much bigger failures, as evidenced by the grounding of Swissair, which was seen as a national trauma. The United States has lost TWA and PanAm, but Americans have invented the concept of low cost airlines with Southwest or JetBlue, which have happily replaced the old players. In Europe, EasyJet and similar companies only followed the American model. This entry was posted in Innovation and tagged Christensen, Entreprise Romande, Failure, Innovation, Schumpeter, Switzerland on July 25, 2013 by Hervé Lebret.